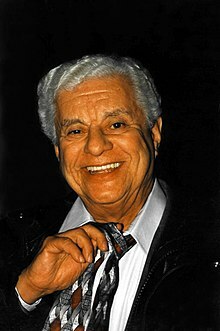 Ernesto Antonio "Tito" Puente (April 20, 1923 – May 31, 2000) was an American musician, songwriter and record producer. The son of Ernest and Ercilia Puente, native Puerto Ricans living in New York City's Spanish Harlem, Puente is often credited as "The Musical Pope", "El Rey de los Timbales" (The King of the Timbales) and "The King of Latin Music". He is best known for dance-oriented mambo and Latin jazz compositions that endured over a 50-year career. He and his music appear in many films such as The Mambo Kings and Fernando Trueba's Calle 54. He guest-starred on several television shows, including Sesame Street and The Simpsons two-part episode "Who Shot Mr. Burns?". His most famous song is "Oye Como Va". During the 1950s, Puente was at the height of his popularity, and helped to bring Afro-Cuban and Caribbean sounds like mambo, son, and cha-cha-chá, to mainstream audiences. Puente was so successful playing popular Afro-Cuban rhythms that many people mistakenly identify him as Cuban. Dance Mania, possibly Puente's most well known album, was released in 1958. Among his most famous compositions are mambo "Oye como va" (1963), popularized by Latin rock musician Carlos Santana and later interpreted, among others, by Julio Iglesias, Irakere and Celia Cruz. In early 2000, he appeared in the music documentary Calle 54. After a show in Puerto Rico on May 31, 2000, he suffered a massive heart attack and was flown to New York City for surgery to repair a heart valve, but complications developed and he died on May 31, 2000. He was posthumously awarded the Grammy Lifetime Achievement Award in 2003. Tito Puente's name is often mentioned in a television production called La Epoca, a film about the Palladium era in New York, Afro-Cuban music and rhythms, mambo and salsa as dances and music and much more. The film discusses many of Puente's, as well as Arsenio Rodríguez's, contributions, and features interviews with some of the musicians Puente recorded with Alfonso "El Panameno" Joseph. Puente's son Richard "Richie" Puente was the percussionist in the 1970s funk band Foxy. Puente's youngest son, Tito Puente Jr., has continued his father's legacy by presenting many of the same songs in his performances and recordings, while daughter Audrey Puente is a television meteorologist for WNYW and WWOR-TV in New York City. In 1995, Tito Puente received the Billboard Latin Music Lifetime Achievement Award. In 1995, Puente was awarded an Honorary Doctorate of Music from Berklee College of Music. In 1999, he was inducted into the International Latin Music Hall of Fame. Puente appeared in the two-part whodunit drama "Who Shot Mr. Burns?" in the sixth season finale and seventh season premiere of American comedy cartoon show "The Simpsons" in 1995. In the shows, Puente joins Springfield Elementary School as a music teacher after the school discovers it is located over an oil well. However, Mr. Burns manages to pump the oil first which makes him the legal owner of the well. This causes the school to fall into debt with budget cuts required to the music and maintenance departments, causing Puente to lose his job. When Burns is later shot, Puente becomes one of the prime suspects but manages to clear himself by performing one of his songs for Chief Wiggum. Seven alternative endings were filmed of various characters shooting Burns. Puente is one of the alternates. Although all endings were filmed, the ending of Maggie Simpson shooting Burns was the ending chosen to air. ^ Lannert, John (June 10, 1995). ""El Premio Billboard" Award Recognizes Tito Puente For His Latin And Afro-Caribbean Musical Contributions". Billboard. Nielsen Business Media. 107 (23): 60. Retrieved April 11, 2014. ^ "Lifetime Honors: National Medal of Arts". Nea.gov. Archived from the original on August 26, 2013. Retrieved October 31, 2012.